My Dobermann (Diva) looking pretty good with the help of Eden joint support. Hard to believe she had major back surgery 9 months ago and could hardly walk, now look at her go. After a few days on catch of the day my itchy, allergic to everything, foot licking Frenchie isn't itchy anymore and he hasn't licked his feet which are now white instead of pink ! He is allergic to chicken, any grain fed animals and whole fish made him sick so even raw feeding didn't work for him... Can't believe the difference really happy we made the change to Eden for him. We first heard from Judith Knott and her Shih Tzu, Lucy, back in 2013. Lucy was a fussy eater; Judith had to get on the floor to hand feed her and, due to some health issues found this difficult and therefore was finding Lucy’s poor eating habits quite stressful.Judith had various discussions with us via our Facebook support group and with a lot of perseverance she was able to gradually improve Lucy’s eating habits and she now eats two meals of Eden each day with only a couple of natural meat based treats during the day, Judith is delighted that she no longer has to hand feed or get on the floor. One Year on Eden Club". Ruby, our yellow labrador, is 14 months old and has been tucking in to Eden for exactly one year today. She is in wonderful condition and has the softest coat. Thanks Eden. How many other dogs out there can join the "One Year on Eden Club"? My babies love their Eden! My springer used to be very fussy with food and had to be encouraged to eat..........now he gobbles every last bite up and even dances with excitement when he sees me getting his bowl ready. I also love that their coats are much shinier. Alfie first savoured the delights of Eden in Oct 2012 & it was lurrrrve at first munch! 2 Best In Shows, numerous Group wins over the past 12 months. We're proud to promote Eden to everyone! Our 3 Leos all on Eden now with no issues.....L to R Fred.. who we got as a pup and our 2 rescues Todd and Blaze ....out with our daughter (she's the human in the background!). After 7 months of eating Eden, Buster the Boxer Staffy cross' alopecia has cleared up and no longer has dry skin on his head. Hi guys, this is our 5 month old little girl chi Lola who has now been fed on Eden since we bought her at 12 weeks old. We put peas, carrots & sweet potato in with her Eden not altogether though her coat is so soft & coming in lovely now. 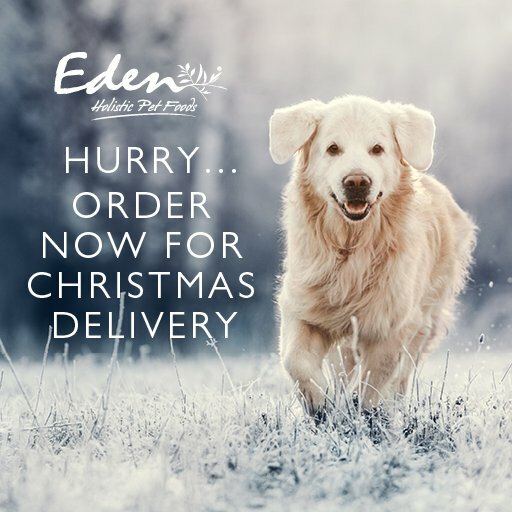 I'm so pleased I came across your site & Eden thank you for all your help. This is Twig the Wonderkid, my baby girl at 7 months old, she has now been an Eden girl for about 2months, I had no problems at all with changing over from the food she was on, she is so healthy and her coat is incredibly soft and shiny. Well my beautiful girls have been on Eden now since September and their coats have never looked better my saint is also better from all the scratching too. Just wanted to share that with you and thank you for all the advice.